Infinite Art Tournament: The Great Movies: "M"
If serial killers were as numbered as the movies and tv representations about em, they would have a voter block going. It would make for a dark funny skit to hear a politician pandering to them. "A deep freeze in every garage and stricter dna testing requirements for all." I think I've seen this movie. It was a while ago but I recall this. 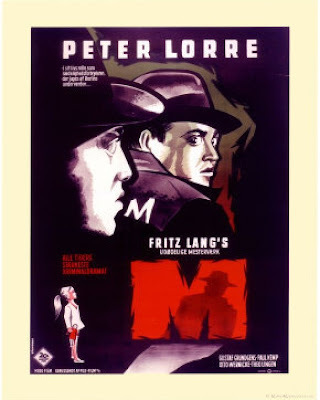 Peter Lorre is a hard one to forget. I did not remember his final commentary though. Interesting. What is the metric in the dorkfest countdown bar? @Boo: Eeek... that would be some baaaad pandering. Looks to me more like "blueness". There's no starting time, no scale other than actual distance on one's screen, nothing to relate the blueness to. There could be a clock with an axe hour hand, like in "David and LIsa", chopping off Nerd Heads as the great day nears. Creeping blueness just makes me wonder if some fabric is bleeding in the washing machine. @karma: Ah, I see what you're getting at. The starting time is the moment last Sunday when I activated the widget. But pay no attention to the blue line. Just focus on the countdown. This was, sad to say, the best countdown widget I could find on Blogger, after far, far too many minutes of looking. I apologize for its inadequacies. On the other hand, karma, don't think I don't suspect you of trying to sneak into DorkFest pole position. And well played. p.s. Creeping blueness can be treated. Talk to your doctor about the options. Checked with my doctor...he said "Chew every bite 40 times".